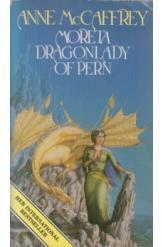 Moreta Dragonlady of Pern by Anne McCaffrey, Sci Fi. Book is in good condition, all pages intact. As the period of Threadfall draws to a close, a new and even greater threat to Pern makes itself known. Moreta, greatest of the dragonriders, is the only one who can save her people from extinction. Part of the Dragonriders of Pern series.